In the second part of our series looking at the untold stories from 1914 - 1918, we revisit the Chinese Labour Corps of Liverpool. The Great War cost the island the lives of nearly 1200 of its men. As 100 years since the end of World War One approaches, we look back at some of the most moving centenary stories of the last four years. Thousands of people have turned out to pay tribute to those killed in conflicts on remembrance Sunday. Today marks 100 years since the battle of the Somme. A woman from Warrington has created a special display at her small parish of St Cross in Appleton Thorn. 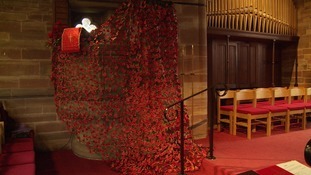 Barbara Johnson lost her Great Uncle in the battle and although not much is known about him she's sewn two thousand poppies onto a net over the pulpit after being inspired by displays in London. The Isle of Man has joined commemorations for Armistice Day. Crowds gathered this morning at Douglas War Memorial to pay respects to the 1,165 who lost their lives in World War 1. More than 8,000 Manx men were enlisted - over 80% of the island's male population of military age. The memorial has a statue of a soldier on a 50ft pillar of Manx granite, called 'The Manxman'. Another service will be held there on Remembrance Sunday at 11am. Seven war memorials have been given listed status to mark Armistice Day, Historic England has announced. England and Scotland players will wear black armbands bearing poppies in their World Cup qualifier at Wembley on November 11.